Maria Montessori was a truly remarkable woman. Born in 1870, she was the first woman to be granted a medical degree from an Italian University. 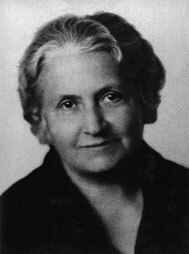 After graduation, Dr. Montessori became director of a school for intellectually disabled children. Her work with these children saw remarkable results. When they competed successfully in public examinations, Dr. Montessori began to wonder what was possible using similar methods with normal children. Her life work began in 1907 with a group of pre-school children from the slums of Rome, when she opened her famous “Casa dei Bambini” or “Children’s House”. Through her observations and work with these children she discovered their astonishing, almost effortless ability to learn. Children taught themselves! This simple but profound truth formed the cornerstone of her life-long pursuit of educational reform. Maria Montessori developed her approach to education over more than 40 years of observation and experimentation. The Montessori approach is concerned foremost with the development of human potential. This approach is based on “following the child”, on recognising the developmental needs and characteristics of children of each age group and constructing the corresponding environment that best meets these needs. Maria Montessori observed that the child moves to adulthood through a series of developmental periods which she called the Planes of Development. Each period is different but is built on the foundation of the preceding one with the Montessori environment and approach tailored to meet the child’s needs at each stage. There are four planes of development. In the first plane from birth to age six, the child is characterised by his or her ‘absorbent mind’, absorbing all aspects of his or her environment, language and culture. In the second plane from age six to twelve, the child uses a ‘reasoning mind’ to explore the world with abstract thought and imagination. In the third plane from twelve to eighteen, the adolescent has a ‘humanistic mind’ eager to understand humanity and the contribution he or she can make to society. In the last plane of development from age eighteen to twenty four, the adult explores the world with a ‘specialist mind’ taking his or her place in the world. Maria Montessori believed that if education followed the natural development of the child, then society would gradually move to a higher level of co-operation, peace and harmony. Montessori education today is practiced in an estimated 20,000 schools worldwide, serving children from birth to eighteen years old.